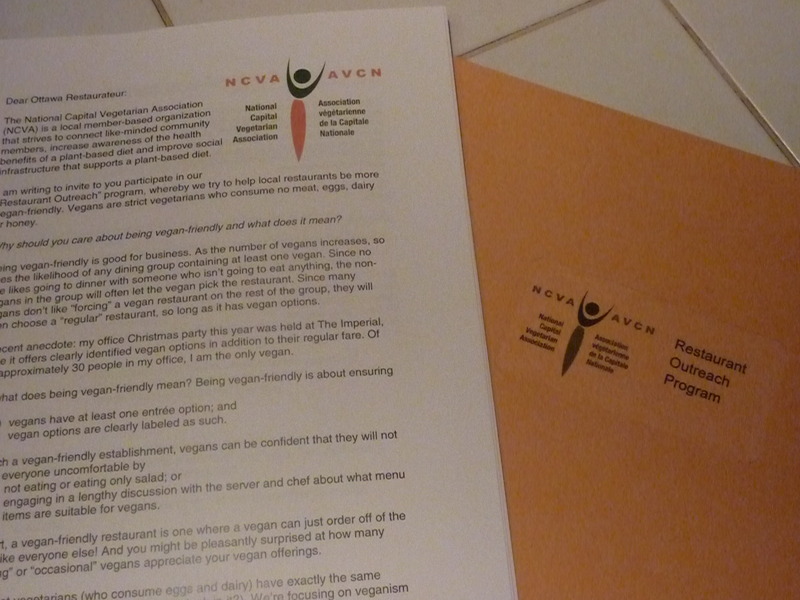 After several months of planning, the NCVA’s Restaurant Outreach Program has officially been launched. This momentous occasion occurred last night when I handed over the first Restaurant Outreach info package to a server at Pubwell’s Restaurant on Preston Street at Elm. So what is the Restaurant Outreach Program? Basically, it’s an attempt to get Ottawa’s omni restaurants to be more vegan-friendly. Our ultimate goal: to produce a list of dozens of Ottawa restaurants at which vegans can order off the menu with neither fear of hidden animal ingredients nor extensive discussions with servers and chefs. How does it work: First, we developed an information package that explains what vegans are, why accommodating them is good for business, and how to add vegan menu items or veganize existing items. The info package is available on the NCVA’s Web site here. Now, the distribution phase has begun! I am starting in Little Italy since that’s where I live, and will move on to the Byward Market, the Glebe, Westboro and beyond. With any luck, Ottawa restaurateurs will heed the call to participate in our program in order to receive our support and publicity. Keep your eyes on the blog for news of new participants, who will also be listed in the Restaurant Outreach section of the NCVA Web site. Now here’s the part where I ask for your help. Individuals interested in hand delivering info packages to restaurants in their area are invited to drop me a line at erin.anne.osullivan@gmail.com. I’ll get the packages to you. All you have to do is hand them over with a smile, and keep track of which restaurants you gave them to. I also invite everyone to have a look at the info package and to offer any suggestions at all for improving our chances of making this campaign a success. Come on, Ottawa veggies! This is your town. This is your food. This is your chance to make marginally more bearable your meals out with bone crunching moms and dads, siblings and significant others, clients and coworkers! Viva la vida!